NRIs, (Non Resident Indians). You are special to us. at the jos alukkas NRI festival, we've got great offers and a whole lot of surprises waiting for you. Welcome home. Assured gifts on evry gold purchase. Exchange offer. 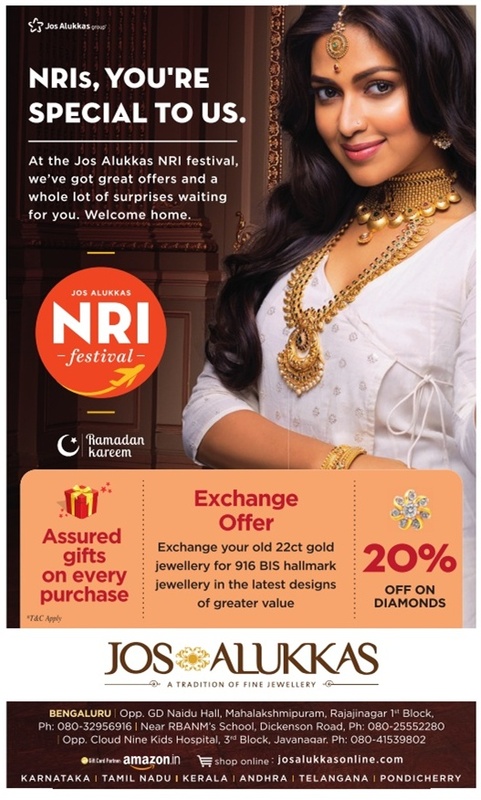 Exchange your ols 22ct gold jewellery for 916 BIS hallmark jewellery in the latest designs of greater value. This offer valid in all Jos Alukkas stores across Karnataka, Tamil nadu, Andhra, Telangana and Pondichery. Cities, Hyderabad, Bengaluru (Bangalore), Chennai.